The Nigerian Army has set up a panel to probe the allegations made by Theophilus Danjuma, former minister of defence. Speaking at the maiden convocation of the Taraba State University, Danjuma alleged that the army had lost its professionalism. He accused the army and other security agencies of colliding with killers to attack Nigerians. The army had denied the allegation, asking Nigerians to disregard the statement of the elder statesman. But on Monday, Tukur Buratai, chief of army staff, inaugurated a panel to examine the issues raised by Danjuma. 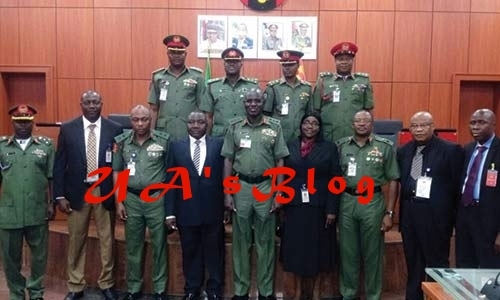 Buratai mandated the committee to thoroughly investigate and unravel the allegations made by the elder statesman who was once a chief of army staff. John Nimyel, a major-general is the chairman of the committee, while Gambo Mohammed, a colonel, is the secretary. Other members of the committee are Alexander Ridley, Stanly Eze, Saka Abubakar, Sani Mohammed and Kayode Olajide, all top army officers. Comfort David, a civil activist and Abudu Aladoja, a lawyer, are also members of the committee.